In 1969, Marty Wilde released 'Diversions', an album of original songs written by himself and several collaborators. One of the songs on the album was Abergavenny, which was a hit in several European countries, but there was also the song In the night. 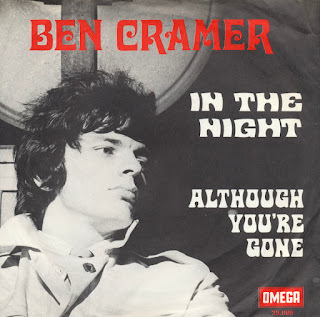 That song was covered that same year by Dutch singer Ben Cramer and released on this single. It spent three weeks in the 'bubbling under' chart of the Dutch top 40, but didn't become a hit. It was included on the album 'My world of music', released on the Omega label in 1969. This year's Dutch entry for the Eurovision Song Contest was written and composed by Pierre Kartner, a.k.a. Father Abraham. The resulting 'Ik ben verliefd Sha-la-lie' ('I'm in love Sha-la-lee') has already been criticised for being out of time and 'not good enough' for the Contest. Some have also questioned whether Kartner was the right person to compose a Eurovision song for the Netherlands. Still, it's not the first time he did this. 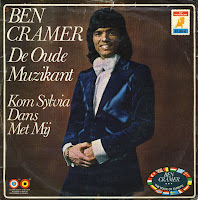 Ben Cramer's 1973 entry for Eurovision was also written and composed by Kartner. 'De oude muzikant' ('The old musician') used some of the same cultural references. Back then, the song finished 14th in a field of 17 competitors. If this year's entry also reaches this position, the Netherlands will be happy: after all, the country hasn't competed in the finals since 2004.